Oviparous or egg-laying snakes make up the majority of snake species. Eggs grow in the oviduct of the female; the yolk sac of the egg provides nutrients to the developing snake. Female snakes lay from two to over 50 leathery-shelled eggs per clutch, depending on the species. Some snake species’ mothers will incubate their eggs by burying them; others by wrapping around them. Typically, the mother does not remain at the time of hatching. The process of laying eggs is called oviposition. Female snakes mate in the spring after leaving hibernation. The majority of snake species lay eggs, while some give birth to live young. Fertilized eggs grow in the snake's oviduct, growing yolk sacs and developing shell material. Females lay leathery eggs in protected locations, and many species abandon the eggs while some remain to incubate them. Egg-laying in snakes is called oviposition. Female snakes emerge from hibernation in the spring to mate. Because snakes are ectotherms that cannot regulate their body temperature, they prefer warmer conditions for breeding and egg-laying (oviposition). Females generate pheromones to attract males. In some cases after mating, sperm from males are stored in the oviduct of the female for extended periods of time. Upon mating, females find sheltered locations to lay their eggs, such as in leaves or underground. Because the leathery eggs are permeable to water, the female will choose a nest with an ideal amount of moisture to protect her clutch. Much of the egg development occurs within the female’s oviduct prior to oviposition. The ovary releases an ovulated egg via the ostium into the anterior area of the oviduct, called the infundibulum. Immediately, secretions from the oviduct coat the egg. Once the egg moves into the uterus, eggshell production begins via fibers secreted by uterine mucosal glands. The gestated egg moves out of the uterus and through the oviduct’s cloacal opening via rhythmic muscle contractions. Some pregnant snakes bask with their bellies facing up prior to laying eggs, possibly to warm their reproductive tracts. The mother snake lays eggs in succession as a cluster, and the eggs adhere to each other. This gives the eggs a static position until they hatch, as egg turning or accidental displacement threatens the hatchlings’ survival. While many mother snakes do not remain with their eggs after oviposition, some do provide defense. Python mothers, for example, coil themselves around their eggs to hide and warm them via shivering. Some other examples of egg-laying snakes include bullsnakes, rat snakes and kingsnakes. Most snakes lay eggs. However, a smaller percentage of viviparous snakes give birth to live babies, which receive nutrition from the mother. These kinds of snakes evolved approximately 175 million years ago. In the distant past, snakes underwent transitions between egg-laying and live birth before the dominance of oviparous snakes. 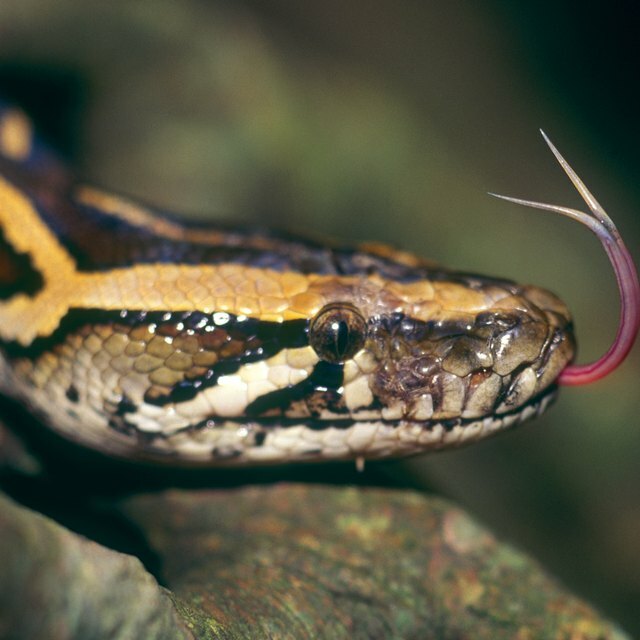 Viviparity in snakes correlates strongly with colder and higher latitude and altitude locales. Some viviparous species do exist in warm climates, possibly from cold-climate lineages. Embryos remain protected from the colder conditions by developing inside the mother snake. Garter snakes represent a species of viviparous snake. Still another variety of snakes is called ovoviviparous. Ovoviviparous snakes have a form of egg retention in which embryos gain nourishment from a yolk sac but the young are birthed without shells. Eggs remain inside the mother snake while they hatch, or they hatch as soon as the eggs are laid. Ovoviviparous snake examples include cottonmouths and copperheads. Dianne, J.. "How Do Snakes Lay Eggs?" Sciencing, https://sciencing.com/snakes-lay-eggs-4569450.html. 10 April 2018.